Mung Beans are a small, oval type of green bean that is high in fiber. When the bean is split in half it is referred to as moong dal. It is native to Bangladesh, India, Pakistan, China, Thailand and other Southeast Asian countries. It is also cultivated in hot and dry regions of southern USA and Europe. They are commonly used in Chinese cooking as well as other Asian cuisines and are generally eaten whole or as bean sprouts. They are also used to make the dessert Green Bean Soup. The starch is also commonly extracted and used to make jellies and cellophane noodles. Choosing: Whole seed of bright green color is a surface indicator of good sprouting potential. Harvest damage, prolonged standing in the field, and molding associated with rain damage deteriorates seed coat color and impairs sprouting quality, and may make a seed lot unusable and unsalable. 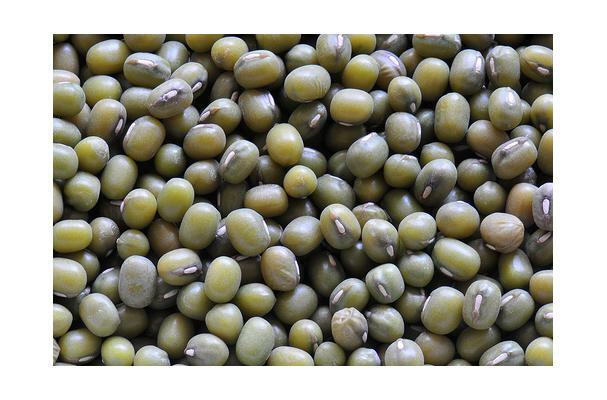 Buying: Mung beans are available at Indian groceries or health food stores. Like many other legumes, the mung bean can be eaten raw when sprouted, or else eaten cooked with the skin on or off.Cooked mung beans can be delicious with spices and seasonings added to them. They can be used in soups and casseroles. Mung beans have been a part of Chinese cuisine for thousands of years. Cleaning: To sprout the beans, soak them overnight and then allow them to sprout for a couple of days. Put them in a dark place and keep them slightly moist--not dry or they will shrivel, and not wet or they will mold. In Indonesia, the mung bean's sweet flavor is enhanced by adding sugar, ginger and coconut milk and enjoyed as a snack.